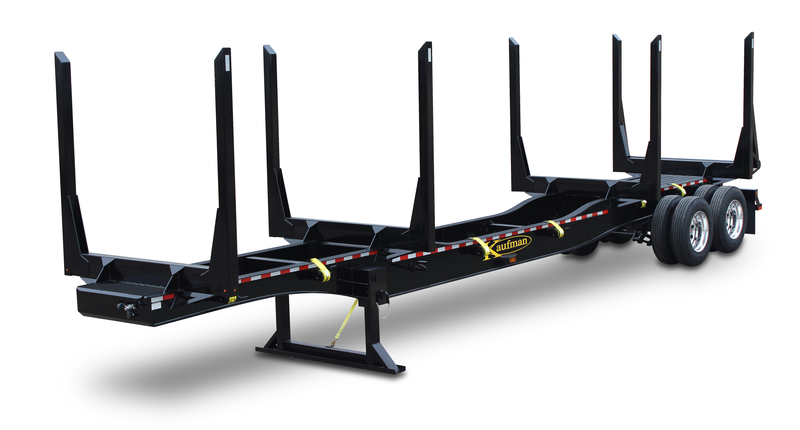 Kaufman Trailers Standard four bolster Log Trailer is built with a 24” deep, high tensile, fully fabricated main beams frame and full depth cross-members at each bolster. Our attention to detail and quality materials are the best in the industry! Frame flanges are heat treated 130 KSI with 80 KSI high tensile webbing. Standard suspension is a heavy duty, underslung, 4-spring Hutchens H-9700. A popular feature of this trailer is the low ride height at the rear. With the underslung suspension, this trailer provides much more stability and eliminates the feared sway when rounding turns and rocking through the woods therefore ensuring you years of service. We also offer the same suspension in the traditional overslung mode. Two popular optional suspensions are also available for a nominal up charge. These are a Watson single point or Ridewell air ride suspension. Our straight frame style log trailers are a best seller providing excellent value at $17,850 + FET. Call Kaufman Trailers today and ask for Log Trailer Sales to speak to one of our knowledgeable sales reps! See our Log Trailer ads in The Truck Paper, Southern Loggin’ Times, and Lumbermen Online. Optional color upcharge for any color other than standard black. Call for details.